Bob Barker gets another big sendoff; Stone Phillips doesn't. 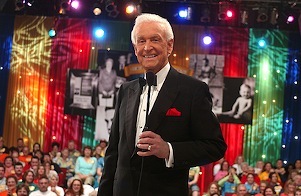 ***Fresh from two time slot-winning CBS specials last week, retiring Bob Barker will get a third when he hosts his last episode of The Price Is Right on Friday, June 15th. The farewell Price then will be repeated that same night in prime-time as a lead-in to the 34th annual Daytime Emmy Awards. Barker has two nominations, his 18th and 19th. The 83-year-old game show legend is winding down his 50th year in television, the last 35 with Price. No one's been named to succeed him yet. 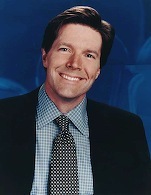 ***Cost-cutting measures at NBC have cost longtime Dateline anchor Stone Phillips his job. He's already been dropped from the program after 15 years and also is being let go by the network's news division. Phillips said in a statement that he's "profoundly appreciative of the many friends and colleagues, past and present, who have been a part of the Dateline family." Ann Curry will now be the show's main anchor. ***It's getting ever-closer between Fox's American Idol and ABC's Dancing with the Stars. Tuesday's last Idol performance show of the season drew 25.2 million viewers while Dancing's results finale had 23 million viewers. Idol had a wider victory margin among advertiser-craved 18-to-49-year-olds, but ABC won the night overall in total viewers after Fox's post-Idol premiere of On the Lot plummeted to 8.5 million viewers nationally. ***CBS has announced an array of presenters for the 61st annual Tony Awards, which it will telecast on June 10th. They include Harry Connick Jr. Neil Patrick Harris, Angela Lansbury, Kevin Spacey, Usher, Felicity Huffman, Rainn Wilson, Bernadette Peters, David Hyde Pierce, William Petersen, Marg Helgenberger, John Turturro, Claire Danes, Carla Gugino, Anne Heche, Eddie Izzard, Audra McDonald, Vanessa Williams and Liev Schreiber. There's no host this year. ***Fox already has named its post-Super Bowl attraction for next year. It'll be House, starring Hugh Laurie. And CBS says that Katie Couric will moderate the final Democratic National Committee-sanctioned presidential debate on Dec. 10th from Los Angeles. ***Encore will have a Memorial Day Jaws movie marathon, beginning at 4 a.m. central with the original Steven Spielberg classic. Following in order are Jaws 2, Jaws III and Jaws: The Revenge. That cycle will keep repeating throughout the day. Also, Encore Westerns is presenting a mega-blast of John Wayne over the holiday weekend, beginning Saturday (May 26) at 11 a.m. central with Chisum. It'll then be wall-to-wall Wayne through Tuesday, with titles including The Searchers, Texas Terror, The War Wagon, Cahill, U.S. Marshall and frequent showings of a 15-minute mini-special titled 100 Years of John Wayne.